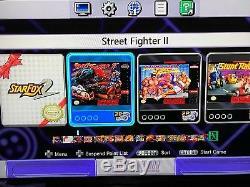 Super Nintendo Classic Edition System SNES - 530+ GAMES! Turbo Reset - Press and Hold "Down + Select". All games come with original box art and saves. NOW contains some of the BEST Fan Made/Hacked Mario Games! 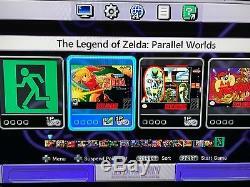 ALSO contains Zelda Parallel Worlds, a complete remake of the original game! Games can be replaced with other games to your liking. Adventures of Batman & Robin. Arkanoid - Doh It Again. Boogerman - A Pick and Flick Adventure. Bubsy in Claws Encounters of the Furred Kind. Captain America and the Avengers. Contra III: The Alien Wars. Daffy Duck - The Marvin Missions. Death and Return of Superman. Donkey Kong Country 2 - Diddy's Kong Quest. Donkey Kong Country 3: Dixie Kong's Double Trouble. Double Dragon V - The Shadow Falls. Dragon - The Bruce Lee Story. Dragon Ball Z - Super Butoden. Final Fantasy - Mystic Quest. Flashback - The Quest for Identity. Flintstones, The - The Treasure of Sierra Madrock. Hagane - The Final Conflict. Home Alone 2- Lost in New York. Lemmings 2 - The Tribes. Lufia & The Fortress of Doom. Lufia II - Rise of the Sinistrals. Magical Quest Starring Mickey Mouse. Marvel Super Heroes - War of the Gems. Mickey Mania - The Timeless Adventures of Mickey Mouse. Might and Magic II - Gates to Another World. Might and Magic III - Isles of Terra. NBA Jam - Tournament Edition. Ogre Battle - The March of the Black Queen. Prince of Persia 2: The Shadow & The Flame. R-Type III - The Third Lightning. Ren & Stimpy Show, The Buckeroos! Ren & Stimpy Show, The Fire Dogs. Spider Man Venom - Maximum Carnage. Street Fighter II Turbo: Hyper Fighting. Super Conflict - The Mideast. Super Mario RPG: Legend of the Seven Stars. Super Star Wars - Return of the Jedi. Super Star Wars - The Empire Strikes Back. T2 - The Arcade Game. Teenage Mutant Ninja Turtles - Tournament Fighters. Teenage Mutant Ninja Turtles IV - Turtles in Time. The Legend of Zelda: A Link to the Past. The Legend of Zelda: Parallel Worlds. Tiny Toon Adventures - Buster Busts Loose! 1943: The Battle of Midway. Adventures of Rocky and Bullwinkle and Friends, The. Back to the Future II & III. Bard's Tale, The: Tales of the Unknown. Barker Bill's Trick Shooting. Base Wars: Cyber Stadium Series. Batman: Return of the Joker. Battletoads & Double Dragon: The Ultimate Team. Boy and His Blob, A - Trouble on Blobolonia. Bugs Bunny Birthday Blowout, The. Bugs Bunny Crazy Castle, The. Captain Planet and the Planeteers. Castlevania II: Simon's Quest. Castlevania III: Dracula's Curse. Chip'n Dale Rescue Rangers. Chip'n Dale Rescue Rangers 2. Dig Dug II: Trouble in Paradise. Rock: The Legend of the Lost City. Double Dragon II: The Revenge. Double Dragon III: The Sacred Stones. Dragonstrike, ADvanced Dungeons & Dragons. Flintstones, The: The Rescue of Dino & Hoppy. Flintstones, The: The Surprise at Dinosaur Peak! Godzilla II: War of the Monsters. Golgo 13: The Mafat Conspiracy. Golgo 13: Top Secret Episode. Gremlins 2: The New Batch. Heroes of the Lance, Advanced Dungeons & Dragons. Hillsfar, Advanced Dungeons & Dragons. Ikari Warriors II: Victory Road. Ikari Warriors III: The Rescue. Indiana Jones and The Last Crusade: Ubisoft's. Iron Tank: The Invasion of Normandy. Jetsons, The: Cogswell's Caper. Little Mermaid, Disney's The. Little Nemo: The Dream Master. Mutant Virus, The: Crisis in a Computer World. Ninja Gaiden II: The Dark Sword of Chaos. Operation Wolf: Take no Prisoners. Romance of the Three Kingdoms. Romance of the Three Kingdoms II. Simpsons, The - Bart Vs.
Simpsons, The: Bartman Meets Radioactive Man. Solstice: The Quest for the Staff of Demnos. Spider-Man: Return of the Sinister Six. Star Wars: The Empire Strikes Back. Teenage Mutant Ninja Turtles II: The Arcade Game. Teenage Mutant Ninja Turtles III: The Manhattan Project. Tiny Toon Adventures 2: Trouble in Wackyland. Top Gun: The Second Mission. Ultima: Quest of the Avatar. Wheel of Fortune: Featuring Vanna White. WWF King of the Ring. WWF WrestleMania: Steel Cage Challenge. Zelda II: The Adventure of Link. Item will be packed with care. Message me with any questions. Thanks for looking and check out my other items. 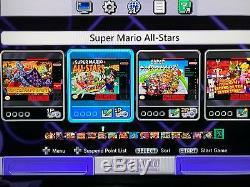 The item "Super Nintendo Classic Edition Console SNES Mini MODDED 530+ Games! 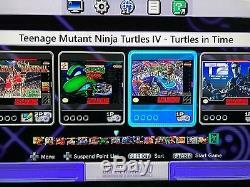 NES, SNES" is in sale since Tuesday, July 17, 2018. This item is in the category "Video Games & Consoles\Video Game Consoles". The seller is "samustoys" and is located in New York, New York. This item can be shipped to United States, Canada, United Kingdom, Denmark, Romania, Slovakia, Bulgaria, Czech republic, Finland, Hungary, Latvia, Lithuania, Malta, Estonia, Australia, Greece, Portugal, Cyprus, Slovenia, Japan, Sweden, South Korea, Indonesia, Taiwan, South africa, Thailand, Belgium, France, Hong Kong, Ireland, Netherlands, Poland, Spain, Italy, Germany, Austria, Israel, Mexico, New Zealand, Philippines, Singapore, Switzerland, Norway, Saudi arabia, Ukraine, United arab emirates, Qatar, Kuwait, Bahrain, Croatia, Malaysia, Brazil, Chile, Colombia, Costa rica, Dominican republic, Panama, Trinidad and tobago, Guatemala, El salvador, Honduras, Jamaica, Antigua and barbuda, Aruba, Belize, Dominica, Grenada, Saint kitts and nevis, Saint lucia, Montserrat, Turks and caicos islands, Barbados, Bangladesh, Bermuda, Brunei darussalam, Bolivia, Ecuador, Egypt, French guiana, Guernsey, Gibraltar, Guadeloupe, Iceland, Jersey, Jordan, Cambodia, Cayman islands, Liechtenstein, Sri lanka, Luxembourg, Monaco, Macao, Martinique, Maldives, Nicaragua, Oman, Peru, Pakistan, Paraguay, Reunion.